This example shows how to implement undo/redo functionality with the Qt undo framework. In the Qt undo framework, all actions that the user performs are implemented in classes that inherit QUndoCommand. An undo command class knows how to both redo() - or just do the first time - and undo() an action. For each action the user performs, a command is placed on a QUndoStack. Since the stack contains all commands executed (stacked in chronological order) on the document, it can roll the state of the document backwards and forwards by undoing and redoing its commands. See the overview document for a high-level introduction to the undo framework. The undo example implements a simple diagram application. It is possible to add and delete items, which are either box or rectangular shaped, and move the items by dragging them with the mouse. The undo stack is shown in a QUndoView, which is a list in which the commands are shown as list items. Undo and redo are available through the edit menu. The user can also select a command from the undo view. We use the graphics view framework to implement the diagram. We only treat the related code briefly as the framework has examples of its own (e.g., the Diagram Scene Example). MainWindow is the main window and arranges the example's widgets. It creates the commands based on user input and keeps them on the command stack. AddCommand adds an item to the scene. DeleteCommand deletes an item from the scene. MoveCommand when an item is moved the MoveCommand keeps record of the start and stop positions of the move, and it moves the item according to these when redo() and undo() is called. DiagramScene inherits QGraphicsScene and emits signals for the MoveComands when an item is moved. DiagramItem inherits QGraphicsPolygonItem and represents an item in the diagram. The MainWindow class maintains the undo stack, i.e., it creates QUndoCommands and pushes and pops them from the stack when it receives the triggered() signal from undoAction and redoAction. By connecting the undo stack's canRedoChanged() and canUndoChanged() signals to our undo and redo action's setEnabled() slot we make the actions disabled when the stack cannot undo and redo commands. The rest of the constructor sets up the DiagramScene and QGraphicsView. The QUndoView is a widget that display the text, which is set with the setText() function, for each QUndoCommand in the undo stack in a list. The createActions() function sets up all the examples actions in the manner shown above. We can connect our undoAction and redoAction directly to the stack's undo() and redo() slots as we disable the actions when the stack cannot do undo and redo. For the other actions we have implemented slots in the MainWindow class. We have to use the QMenu aboutToShow() and aboutToHide() signals since we only want deleteAction to be enabled when we have selected an item. We also want the text() to be shown in the undoAction and redoAction menu items. We simply push a MoveCommand on the stack, which calls redo() on it. An item must be selected to be deleted. We need to check if it is selected as the deleteAction may be enabled even if an item is not selected. This can happen as we do not catch a signal or event when an item is selected. We implement itemMenuAboutToShow() and itemMenuAboutToHide() to get a dynamic item menu. These slots are connected to the aboutToShow() and aboutToHide() signals. We need this to disable or enable the deleteAction and fill the redoAction and undoAction menu item with the text from the next QUndoCommand that will be redone or undone. The addBox() function creates an AddCommand and pushes it on the undo stack. 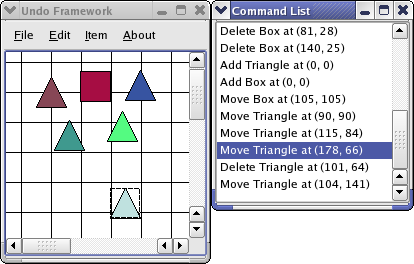 The addTriangle() function creates an AddCommand and pushes it on the undo stack. tr("The <b>Undo</b> example demonstrates how to "
The about slot is triggered by the aboutAction and displays an about box for the example. The AddCommand class adds DiagramItem graphics items to the DiagramScene. We first create the DiagramItem to add to the DiagramScene. The setText() function let us set a QString that describes the command. We use this to get custom messages in the QUndoView and in the menu of the main window. We set the position of the item as we do not do this in the constructor. The DeleteCommand class implements the functionality to remove an item from the scene. We know that there must be one selected item as it is not possible to create a DeleteCommand unless the item to be deleted is selected and that only one item can be selected at any time. The item must be unselected if it is inserted back into the scene. The item is simply reinserted into the scene. The item is removed from the scene. The mergeWith() is reimplemented to make consecutive moves of an item one MoveCommand, i.e, the item will be moved back to the start position of the first move. We save both the old and new positions for undo and redo respectively. We simply set the items old position and update the scene. We set the item to its new position. Whenever a MoveCommand is created, this function is called to check if it should be merged with the previous command. It is the previous command object that is kept on the stack. The function returns true if the command is merged; otherwise false. We first check whether it is the same item that has been moved twice, in which case we merge the commands. We update the position of the item so that it will take the last position in the move sequence when undone. The DiagramScene implements the functionality to move a DiagramItem with the mouse. It emits a signal when a move is completed. This is caught by the MainWindow, which makes MoveCommands. We do not examine the implementation of DiagramScene as it only deals with graphics framework issues. We draw a grid in the background of the DiagramScene, so we use a resource file. The rest of the function creates the MainWindow and shows it as a top level window.